Interview with Gregory III Laham, Melkite Patriarch of Damascus. Doubts about the identity of those leading the revolt. Even today, demonstrations and violence in many cities. Today is the 'Day of wrath "and for the first time an invitation to take to the streets comes from Muslim Brotherhood. Rome (AsiaNews) - The riots and violence in Syria is a major concern for the Christian churches in the country. Even today, "Day of wrath", the first to see the Muslim Brotherhood take to the streets, news of protests and repression, deaths and injuries are filtering through not only from Deraa, but from Damascus, Latakia, Homs, Hourani, Deir Zoour and other cities. Fear for the future is mounting, that it will be one of chaos or fundamentalist governments, one that will leave Christians no option but to emigrate abroad. This is what Gregory III Laham, Melkite Patriarch of Antioch and All the East, tells AsiaNews today. The patriarch stresses the participation of Christians in the pain and suffering of the people. Respect for the deaths that have occurred in recent weeks - at least 500 since the anti-Assad demonstrations started - the Easter holiday was celebrated without music and processions, out of respect for those in mourning. Gregory III, however, expresses doubts about the identity of those who lead the uprising (criminals? Fundamentalists? Jihadists?) About his growing concerns for the future. The Melkite Patriarch believes a way to avoid a violent revolution needs to be found on that leads to progress in stability. This is why His Holiness has written letters to European countries and the Americas asking them to help prevent the nation from sliding into chaos and to move swiftly to resolve the Israeli-Palestinian problem, the real priority for peace in the Middle East and the world. Your Beatitude, as a Christian how do you view the situation in Syria? 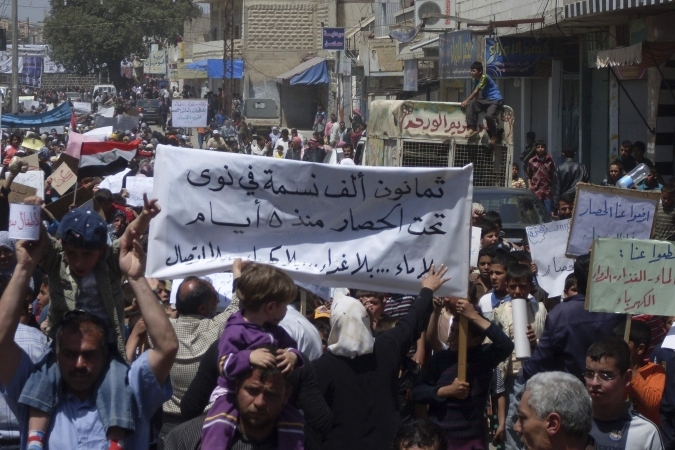 The movements and revolts that are shaking Syria worry the Churches and Christians. Not so much for the present, but for the future, for what to expect. In the past, every revolt in the Middle East was followed by a large wave of Christian emigration to Europe, America or Australia. I fear that even now the same will happen, further emptying an already dwindling Christian community. Some Muslim scholars also are concerned about a possible depletion of Christians in Syria. And are demanding their presence be defended and safeguarded. Are there problems for the Christian communities? So far, the riots have not been of a sectarian nature, they are not a Christian-Muslim conflict. Indeed, during demonstrations in Homs, Aleppo and Damascus, young Muslims have offered to protect churches, providing security cordons around the buildings to prevent criminal acts. In solidarity with those killed in clashes in recent weeks, Christians have celebrated the rites of Holy Week and Easter in a very sober manner, no processions, music or festivities, to correctly participate in the mourning of the population. At the same time we are trying to play the role of mediators in conflicts that have emerged in Syrian society, so that tensions do not grow until the inevitable. I have personally sent letters to 15 European countries, the United States, and the Americas asking their governments to help improve the situation without any "revolution" violent. What is your impression of the protesters? The impression we have from inside is that some groups whose main objective is to provoke a violent response from the government are infiltrating the protests that originally grew from social and economic problems. In this way, tension is stoked to the point of gaining the international community’s condemnation and demands for a regime change from outside. There are very mysterious aspects pervading all of this: there are criminals involved in the protest, there is a massive introduction of weapons in the country to provoke a confrontation .... The future is very uncertain and no-one knows what the outcome will be, no one knows who these people are. Sure, there are young, frustrated people, but many say that among them are criminals and even fundamentalist Muslims who cry for jihad. This is why we fear that giving way to violence will only lead to chaos. I think the tactics of a phony war are being used against Syria. How would you explain the West’s exaltation of the Syrian protests and its harsh accusations of violations of human rights? There are political problems and pressures to shake up the balance of power in the Middle East: the alliance with Iran [and Syria-ed], Israel’s concern... In all things that happen in the Middle East, there is always a link with the Israeli-Palestinian crisis, war, emigration ... we have been in this situation for over 62 years. For this I sent the letter to European and American governments and I invited them to put pressure on their governments to tackle the Israeli-Palestinian problem as a priority: only in this way will there be less migration, less terrorism, less fundamentalism, less violence. This is my mission and it is what I also emphasized in the Synod of Bishops last October and the pope appreciated it. Peace is also important for the future of Muslim-Christian dialogue in Syria and the world. If the crisis continues to force Christians to migrate, the Arab world will become exclusively Muslim increasing the likelihood of a cultural conflict between the Arab-Islamic world and Western-Christian world. The presence of Christians in the Middle East saves the Arab Middle East by not to reducing it to pure Islam. If Syria is helped to overcome this situation of chaos to one of stability guaranteed by dialogue with the population, the future will be better for everyone. Is the Assad family rule a positive thing for Syria? In these 40 years, Syria has made great advances in agriculture, economics, education, even university, generating many jobs. There has been less development on a socio-political level, but the everyday lives of people has improved significantly. Even in religious freedom, there has been a lot of progress. A few months ago I was able to organize - with the sponsorship of the government - an international meeting on the fruits of the Synod of the Middle East (celebrated in the Vatican last October), with the participation of at least 3,500 persons, four patriarchs, 13 churches. Regarding political reform, we must remember that in the Arab Middle East, in addition to Lebanon, there are democracies. There are parties, elections, but governments try to control the whole society. And in many situations, this is also necessary.